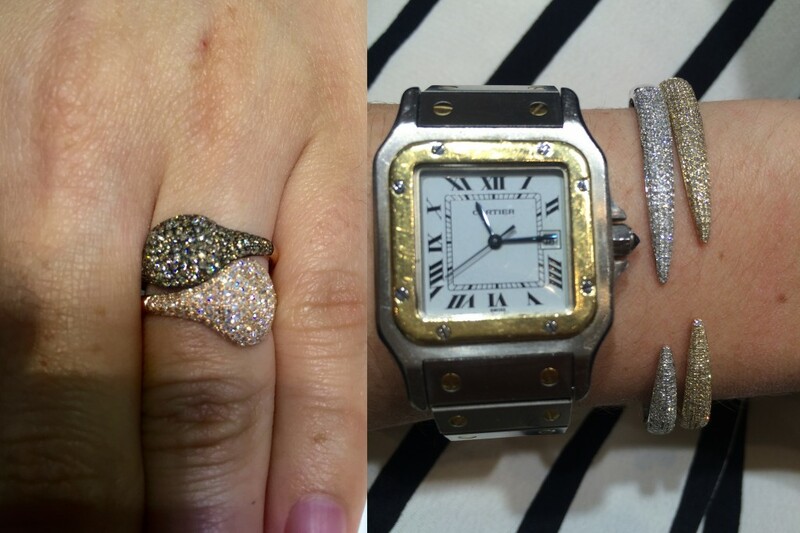 We’ve just returned from the biggest jewelry show on earth and have some truly amazing pieces on their way to Star! We scoured the show to bring you new and exciting pieces. These are some of our favorite trends this year. 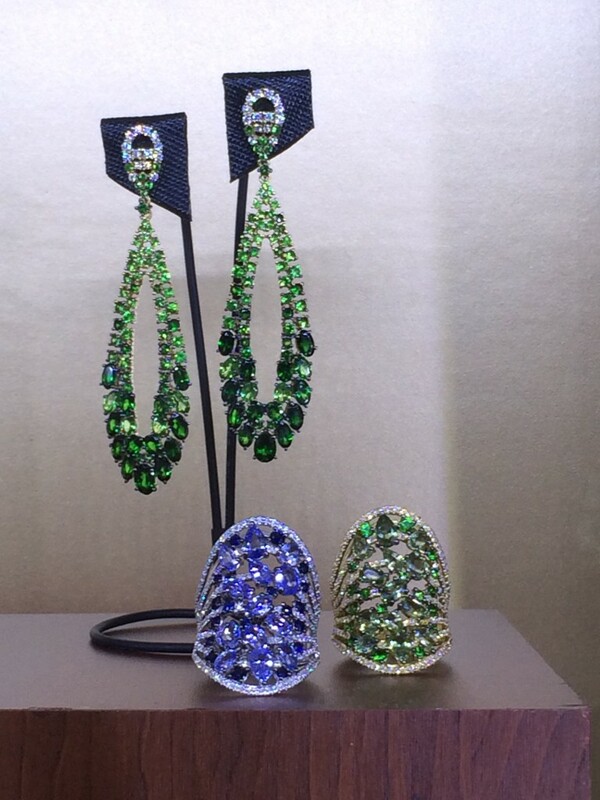 Earrings- Ear climbers continue to be a hot this year, but 2015 is a year for extremes. 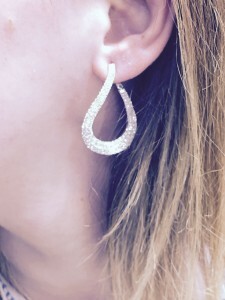 To contrast the sleek minimalism of ear climbers, we are bringing in earrings that demand attention. Our favorite new earring trend is the flat hoop. Imagine a diamond hoop in your ear. Now imagine that someone took that hoop and flattened it so all the diamonds are facing forwards. Sounds weird, but look at the pictures below- it’s gorgeous! We’re always looking for new ways to reinvent the classics, and we think this fresh take on hoops is a keeper. Necklaces- Collar necklaces are back! Showcase your décolleté with a statement-making open collar. We picked up a dreamy white gold and diamond piece that reminds us of constellations clustered around your neck that is, in a word, wow. 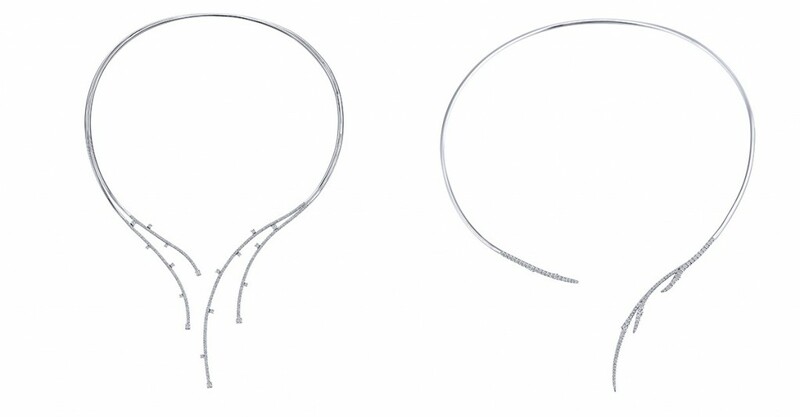 Here are some other open collars that will be arriving at Star Jewelers soon. Rings and Bracelets- The stacking trend isn’t going anywhere. Spangly open bangles look chic alone or stacked- the more the better! The same trend holds true for rings. Either pair delicate bands together or go bold with a cocktail ring. And don’t let your ring finger have all the fun- how great would these stacked pave diamond rings look on your middle finger? Stacking pave diamond rings and open diamond bangles will be big in 2015! -70’s inspired looks remain huge. Mixing chokers with long, dainty layering pieces, like a lariat, brings the 70’s look into 2015. Don’t forget to add bangles and sleek hoops for a modern it-girl look. And if you’ve yet to embrace the resurrection of yellow gold, it’s time to give it another try! 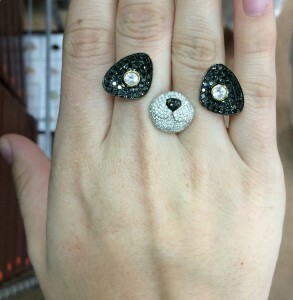 Just to show you some of the more out there pieces we see- we thought this two-finger panda ring was funny! Love the flat hoop earrings with diamonds. Do you have the, in the shop? Hi, Judy! We do… they’re gorgeous! Give us a call at 614.235.4333 with any questions!